After being sick one week and having a crazy Easter the next, I finally have a review! This week, I am reviewing The Magic Mirror by Susan Hill Long. A foundling girl with a crooked leg and a crutch doesn’t expect life to be easy. Indeed, Maggie’s dearest wish is to simply not feel so alone. So when she spies a man behind bars in a magic mirror said to show one’s truest desire, she feels sure he is the father she’s always longed for—and she sets off on a quest to find him. Along the way, Maggie meets both kindly pilgrims and dastardly highwaymen. She discovers she bears a striking resemblance to the princess Petronilla. Their connection is so remarkable that Petra believes Maggie must be her lost sister who fell from the castle wall and was swept downriver as a baby. What a turn of fate! From reviled foundling to beloved royal! But being the lost princess turns out to be more curse than blessing given the schemes of the current king… And if Maggie’s a princess, then who is the man she spied in the magic mirror? This is a grand middle grade adventure story full of mistaken identities, lost loves, found families, and a tantalizing tinge of magic. The Magic Mirror has numerous good qualities, but it also has several bad ones that should serve as a warning for authors. One of the good qualities is the vivid world that Long creates in the story. Every description and event contributes to the medieval setting that is at times a good representation of life during the era and at times a magical, mysterious place to be in. 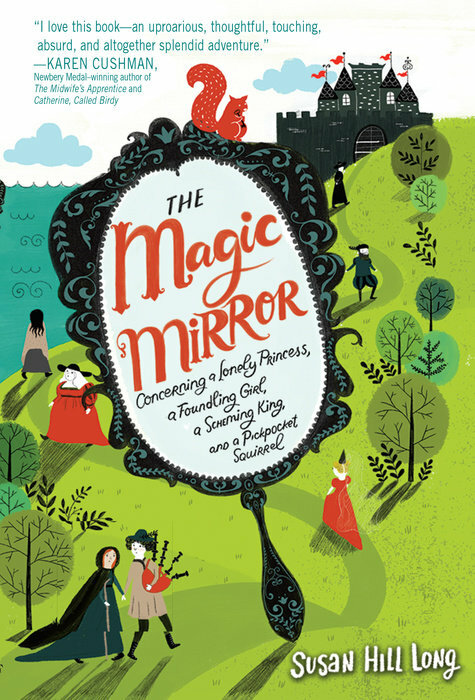 The plot starts out wonderfully, with Margaret leaving her small hometown and brusque, rude guardian to find a person that she saw in a magic mirror. She gains kind, fun friends, has exciting encounters with different villains, and passes through all sorts of areas, while her guardian, Minka, who had not left her home in years, goes on a quest to find her. However, the end of the story is simply not satisfying. One major mistake in the novel is that several characters who become important later in the story, such as a girl named Urchin, are never developed at all. In Urchin’s case, she never develops any personality or even does anything at all of relevance to the story, making a major plot twist involving her fall flat. Another character, Lucy, seems to be almost involved in some sort of conspiracy as she runs through the background of the story several times; however, there is no real conspiracy, and her earlier appearances foreshadow excitement that simply does not come. In the last several chapters, the plot becomes exceedingly hard to follow, and the villain at the end of the book is “defeated” by being knocked unconscious (what happens when he wakes up?). And to seal the deal, an arranged marriage between one of the characters and a rumored imbecile (who is much older than her) is validated at the end of the story when the man turns out to be a fine husband (who is still much older than her). First, then why was he rumored to be an imbecile? Second, are we now trying to teach children that arranged marriages between adult men and underage women don’t lead to horrible abuse and violations of basic human freedom? The point of this review is to show that the great qualities of a book can be undone extremely easily at the end If the author loses sight of the book’s main ideas and simply races to the finish line. If you don’t give up at the end of writing or accomplishing any other task, the result will be so much more satisfying to others and to you, as you will know that you gave the task your all and made something extraordinary! Thanks for your review. As a writer, it was really helpful to hear what you didn't think worked with this story. Tells me things that I should watch for in my own writing. Thanks for your honest thoughts on this book. I'm going to read this story and see if I agree, although what you stated here is exactly what I try to avoid in my own writing. Ohhh. The man in the mirror is interesting. Sorry you were disappointed by the development of other characters in the book, but glad you recovered enough to read and review this one. I am curious to read this story, although I didn't know about it until today. I'm always curious what writers do right and wrong and enjoyed your thoughts. The beginning draws you into the story. Thanks for your honest review. I loved both Rump and Catherine, Called Birdy, so I may pick this up for the world building, despite its disappointing elements. I'm glad you're feeling better, and back to MMGM! Great to see that not every book is "great" and that you can express both sides! Very instructive post. I appreciate it. The summary intrigued me, but your insightful review made it clear this book is not worth my time. I appreciate your honest remarks.